We can never go back, but San Francisco’s de Young Museum’s current “Summer of Love” exhibit (April 8 – August 20, 2017) allows us to do just that. 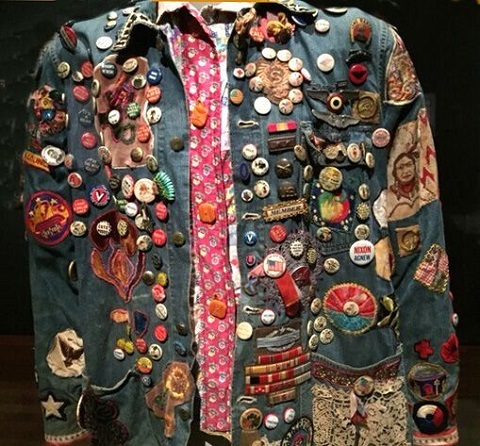 For a couple of hours fashion, art, photography and music from the 1960’s thrusts us into a noisy and voluminous trip back to the counterculture revolution. We tend to import our prejudices into any art event, but this show is an exception. There is no mistaking the purpose and message of this circus of cultural and artistic eccentricity. At times it seems to pit the serious Vietnam anti-war movement against the flower child’s personal, internal rebellion. In many ways the two fueled one another’s revolution, and drew them together in a common cause. The initiation into this arena of protest and social change was psychedelic experimentation, a new music sound and a fierce energy for a new world message. This defined San Francisco, and the Haight-Ashbury and North Beach districts were the hub of change. It proved to be far-reaching. Rebellion became a visual language. 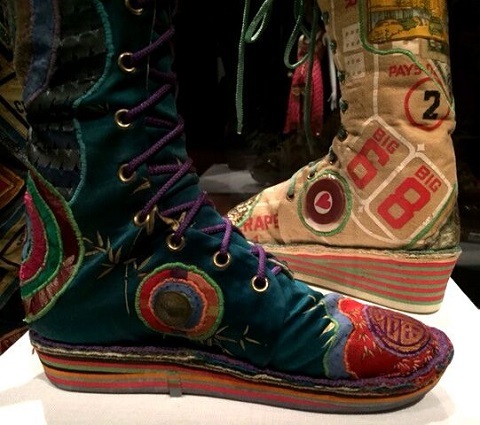 The de Young’s display of counterculture fashion refreshes our memory of how a ferocious demonstration of color, design and craft was a major participant in the political narrative. 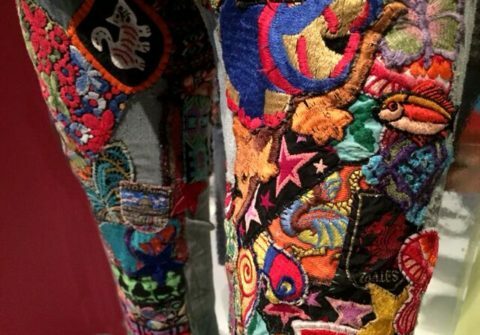 Jacky Sarti customized landlubber jeans of denim with appliquéd cotton patches, ribbons, cotton molas. Made for Peter Kaukonen of Black Kangaroo. 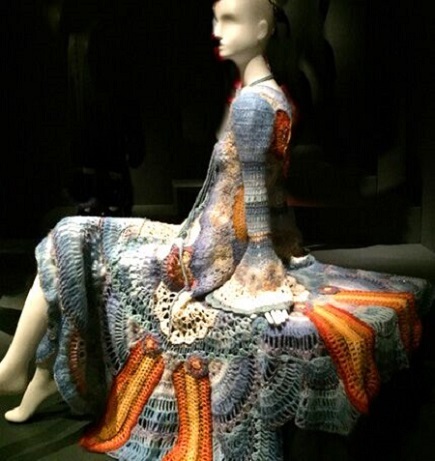 The detailed craftsmanship and lively mix of colors, patterns, textiles and heavy embroidery influenced Yves Saint Laurent, who elevated it to chic wear in the 1970’s. Elaborately embroidered and appliquéd textiles and political buttons were found on everything from jeans to shoes to accessories. The primary cannon of fashion was to be individual, free, natural and optimistic. Mickey McGowan appliquéd Chinese silk shoes with complex weaves, silk velvet and rubber soles. Ideas borrowed from Art Nouveau, Eastern religion, and Native American traditions became icons of the era. These associations with history and philosophy suppressed conventional design and led to a world-wide fashion revolution. 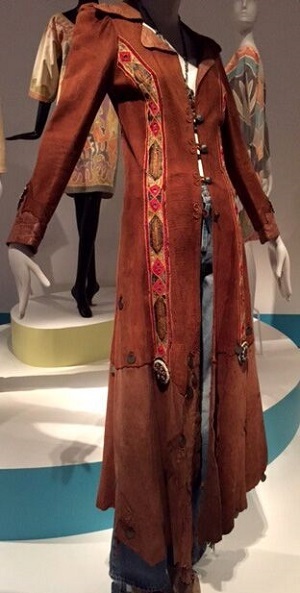 Today the relevance of fashion from this period continues to be the language of mainstream designers under the trope of “bohemian chic.” The full version of rebellion went beyond fashion, and extended to art, music, poetry and prose. 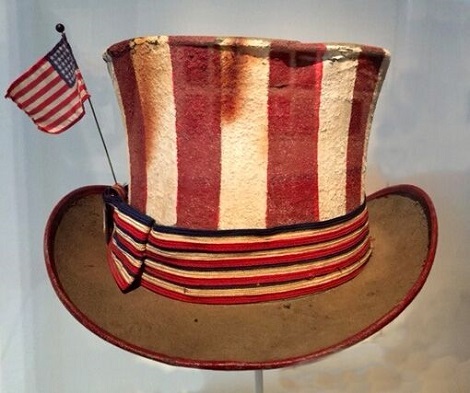 The draft loomed before all young men, and fueled an urgent need for change. “The Trips Festival” of 1966 was the spring board of the revolution. This pivotal gathering unified political activists from Berkeley and the bohemians of Haight-Ashbury. 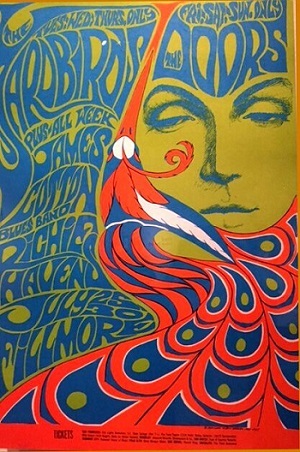 “A gathering of the Tribes for a Human Be-In”, organized by activist Stewart Brand, promoter Bill Graham and author Ken Kesey and his cohorts – the merry pranksters – and composer and artist Ramon Sender, took place at the Longshoremen’s Hall on January 21 to 23, 1966. Dazzling, theatrical effects with liquid light (a chemical mix allowing photographic printing on any surface using standard darkroom procedures) and slide shows, film projections, electronic sounds, rock groups, experimental theater and dance was the beginning of a firm platform for change. More than 3,000 people attended. It was a grand collaboration that forced everyone to question, reflect and be moved. Photographs throughout the show of Ginsberg, Kandel, Leary, Snyder, Watts and the city’s rock bands and concerts pull together a consecutive history of this era of change. 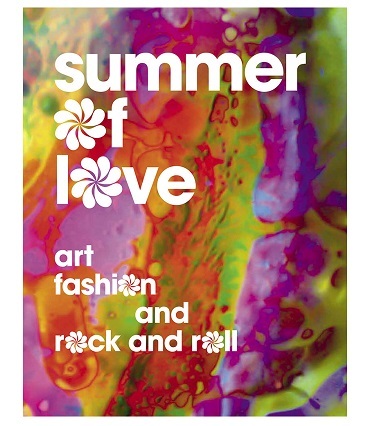 “The Summer of Love” exhibit does its best to resurrect this spectacle for us. There are two light shows to wander through, one of which encourages us to linger in a flashing room of colored lights with bean bag seating. Moving from the light show one finds oneself in floor to ceiling replicas of 1960’s posters, with a large collection of original first editions under glass. 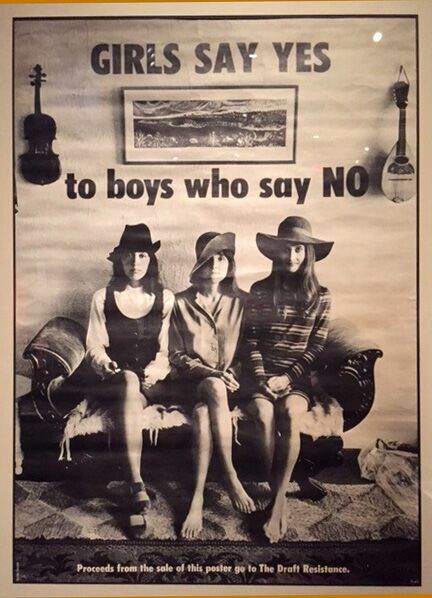 These mass-produced posters were displayed everywhere in Haight-Ashbury and North Beach. Most famous were Print Mint and Friedman Enterprises, underground comic and poster publishers and retailers, where they were papered from floor to ceiling. Close to 25,000 posters sold every month . Many were commissioned by Bill Graham and Chet Helms, major music promoters. Messages of social and political demands targeted military personnel, and concerts benefited environment issues and civil and women’s rights. 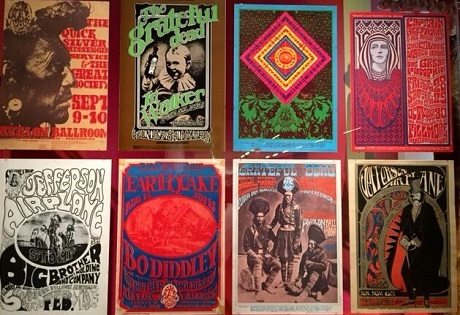 The bright neon colors and patterns of rock posters were often meant as a visual representation of an LSD trip. They drew inspiration from the Art Nouveau period, but because they borrowed from Surrealism to Pop and Op art, this movement is defined as postmodern. An added stimulation in this expansive exhibit is sound. One can hear a mix of “echoes” from Big Brother and the Holding Company, Jefferson Airplane, Quicksilver Messenger Service, the Grateful Dead, Santana and Sons of Champlin among others. The Summer of Love was far more than a riotous, playful upheaval. The de Young Museum’s exhibit reminds us that the government policies we value today resulted from the interventions of fifty years ago. We still have the power to resist and promote social justice and inclusiveness, and to exercise our first amendment rights. This message resonates profoundly today, as seen in the massive women’s march and our current activist activities, such as “Resist”, “Indivisible” and “Sister District.” It is a hard-won wisdom that can easily be swept away. Wendy Verlaine is a San Francisco Bay Area freelance writer, jewelry designer and owner of Wendy Verlaine Design. Formally a San Francisco gallerist, she continues to stay closely connected to the art world.